Although the pistons appear fine and run quietly I have found that the top rings appear to have too much clearance in the grooves (at least 5+ thou) 2nd rings about 4 thou, Was thinking of replacing rings but the new ones are no thicker so the wear is in the piston . No wear limits in the book, If there were thicker rings I could get the grooves machined. I may get the grooves widened and fit a packing ring under the new rings. New it was 1 thou, 2 thou would be the acceptable limit so new pistons or packers it is. I am thinking of using some of the used oil rail rings which are about 30 thou thick,but my engineer will advise . Bear in mind this old nail does not get thrashed, it just growls around sounding tough and giving you a vibro massage. What I would do now fixing faults and what I did when a nearly broke student are different, however that does not mean all of my old bodges did not work and would not work now. I would just buy new pistons today but would not raise an eyebrow at someone who fitted packers as it would work, just not as long as new pistons due to the long stroke and resulting high piston speed of the Atlas which is the root cause of the issue. I've been doing some thinking (and drawing) regarding my veteran bike issue (for which new pistons are not feasible), but relevant anyway to Robert's plans. If you have two rings instead of one, the spring load and the gas pressure load on the bores will double, and friction losses will increase as will bore wear. If an oil rail ring is below the pressure ring, gas pressure behind the top ring will also be behind the bottom ring, so the bottom ring will push against the bore and once again friction and wear will increase. And the gas will have a chance to escape through twice as many flat contact surfaces. I'm thinking of adding a rigid, pierced (Dommie type) oil control ring above the topmost proper gas pressure control ring. Gas pressure will equalise through the oil control ring, so it won't push against the bore. It would have OD smaller than the bore. And the proper gas control ring will fit smoothly on the lower smooth face of the piston groove in the conventional manner. That way I should have a modern ring sealing against the bore, and smaller friction than I do at present owing to the narrower surface against which gas pressure works. John has added a message about doing things like this. i.e. fitting packing rings. Is this, or was this, something done back in the days when owners were more enthusiastic about re-use and repair rather than like today's philosophy of chucking things away and starting afresh? And, if so, were there any guidelines laid down by proper engineers (like maybe Ricardo, or Phil Vincent, etc.)? Might a ring (of any type - solid or pierced) tend to prevent gas getting behind the proper gas control ring, and thus increase leakage? Robert is planning a 30 thou thick packer ie not the full thickness of the original ring which is probably 1/8" thick ie 125 thou so extra 25% so 125% total. If you are looking to reduce air leakage past the rings and other schemes such as extra rings but reducing friction then look at the rings made in the US by Total Seal, they do gapless and gapped rings and have loads of sizes available. They also do custom rings but for a twin or single that would be pricey, note as a US site you have to search on the inch size not metric. So 3 inches for Atlas/Commando rings. That's a helpful site. 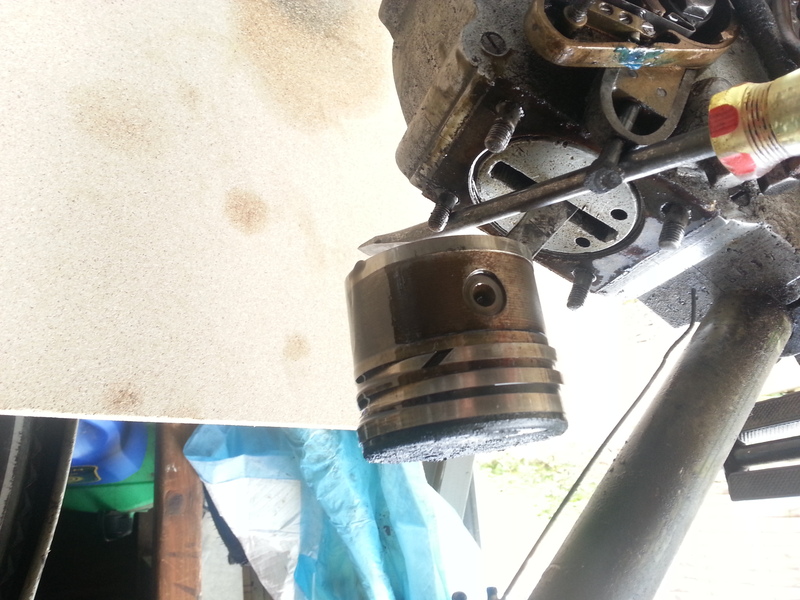 Normally I would not contemplate this but the bores show very little wear and the pistons fit well . I have had poor luck with new pattern parts and now distrust that route.not keen to reduce the life of the barrels without good cause. Going to have the barrels properly measured before final decision. Robert - I've just spoken to a chap at Cox and Turner about my job. But he says they can make rings of pretty much any size and thickness, so you could buy the ones you actually need and not mess about with spacers. He was a bit negative about spacers. After all - you'd need to find (buy) the correct spacer anyway, so why not buy a bespoke ring? I have been in touch with the Company and am likely to order some thicker rings and have the pistons modified locally. Bore wear at worst is 2 thou, .